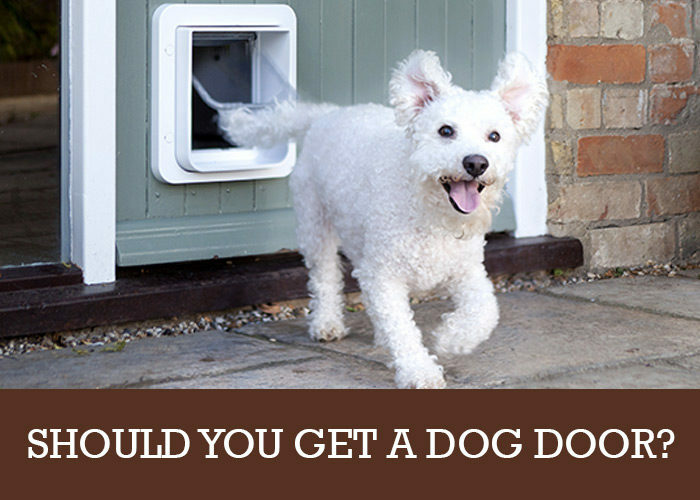 Blog > Products and Supplies > Should You Get a Dog Door for Your Cockapoo? 2 Will You Be at Home When He Uses It? 3 What Size to Choose? Understanding when your dog wants to go outside and being there to open the door in time isn’t always possible. Dogs can go for up to 8 hours without needing to head to the toilet but when he needs to go nothing should stop him. This is why a dog door can be a smart investment. This will allow him to nip outside whenever he feels the need. There are a few different options to take into account when looking for one of these doors, so it is worth bearing the following points in mind. The following are a few models that could be of interest to you when choosing a door for your Cockapoo to use. This pet door is classed as being suitable for cats and dogs weighing up to 18kg and measure 5.7 x 29.4 x 35.2 cm. It is the medium version of the PetSafe Staywell Original 2-Way Pet Door, with small and large versions also available. There are also three different colours to choose from. This is a rigid, transparent plastic flap that can be fitted to all standard windows, walls and doors. It comes with a full installation guide and cutting template. This solid aluminium dog door has reinforced corners, meaning that it is ideal for a dog that comes and goes a lot or for a multi-pet home. It used a magnetic flap closure and has a weather-resistant seal. You get full installation instructions together with the screws and cutting template that you need. The opening is 209 mm x 311 mm in size and it is advertised as being suitable for dogs of up to 18kg. Finally, you get a 2 year warranty with this aluminium dog door. This sturdy, robust dog door comes with a handy security locking panel. It is classed as self-lining to 2 inches (50mm) thickness, so it is suitable for use on all doors and walls. The Pet Mate Dog Mate Dog Door is easy to wipe clean and is waterproof. The vision panel makes it easier to use and it is light enough for cats to use it as well. It comes in small, medium and large sizes for different breeds. This clever pet door using your Cockapoo’s existing microchip to ensure that only he can open it. Indeed, it is said to be compatible with all of the different types of microchip that are use all over the planet. A useful feature is the curfew mode that allows you to set it to be locked or unlocked at different times of day and night. The SureFlap Microchip Pet Door needs 4 C cell batteries but they should last for up to a year. The installation depth is 3.60mm and the dimensions of the flap are 17.8 by 17.0 cm. Suitable for both cats and dogs, this door flap is a four-way operation model. The hinged flap is transparent and the frame is made of solid plastic. The dimensions are 31 x 9.6 x 38.4 cm and it can be used on any type of door. A clever venting systems stops winds and draughts from getting in to the house. Will You Be at Home When He Uses It? Do you want a doggie door that he can only use when you are at home, or would like him to be able to use it even when he is alone? Each dog is different so you need to take into account his personality and the neighbourhood. If a busy street goes past the house and he is easily stressed then you may decide that he only should be able to head outside when you are there to control the situation for him. Since Cockapoos are fairly small dogs you don’t need to look for the biggest dog doors around. You should be able to look at the small to mid-sized models for this type of dog. The best idea is to measure his height and width and then look for a suitable door. You don’t want him to have to squeeze in but you don’t want to get something that is far too big either. If he is still a puppy then don’t forget to leave some growing room for him. You might see some dog doors advertised by the maximum weight of dog that can use them but it is far better to go by the dimensions. There are a number of different types of doggie door you can choose from. Making the right decision in this respect will make life a lot easier for both of you. Traditional flap door. This is the type of swinging flap that he simply pushes open to get in and out. Electronic door. With this kind of door there is an electronic chip that controls the door. This is often contained in his collar, so that only he can open the door. Door mounted. You are probably familiar with this type of door that just gets fitted straight onto a door. Wall mounted. If you don’t have a suitable door for this then you could mount the doggie door straight onto a wall. Patio door. You might think that it is impossible to add a door for your Cockapoo to a patio door. Yet, this can be done without too much fuss and without taking out the glass. There are a number of issues to take into account in order to make a smart choice of doggie door. How easy is it to install? Will you be able to fit it yourself or will you need to hire someone to do it for you? How long will it last for? Do you need an extra strong door because your dog likes to chew or is very clumsy? If so, you might go for a metal door rather than plastic. Will he be the only pet using it? If you have other pets then you will need to take all of their needs into account when choosing a door. Getting a dog door can give your Cockapoo a far greater degree of independence. This is a great addition to your home if you have a dog who is happy to go outside alone whenever nature calls. By taking the time to make a good decision you will get a suitable door that will make his life a lot easier and more enjoyable from now on.